The best Blackberry Jam Muffins are made with small batch homemade quick jam folded into a fluffy batter. But, fear not, you can make yours with whatever good quality jam you have on hand. I sometimes think that I was born in the wrong century, or perhaps later than I should have been in this one. 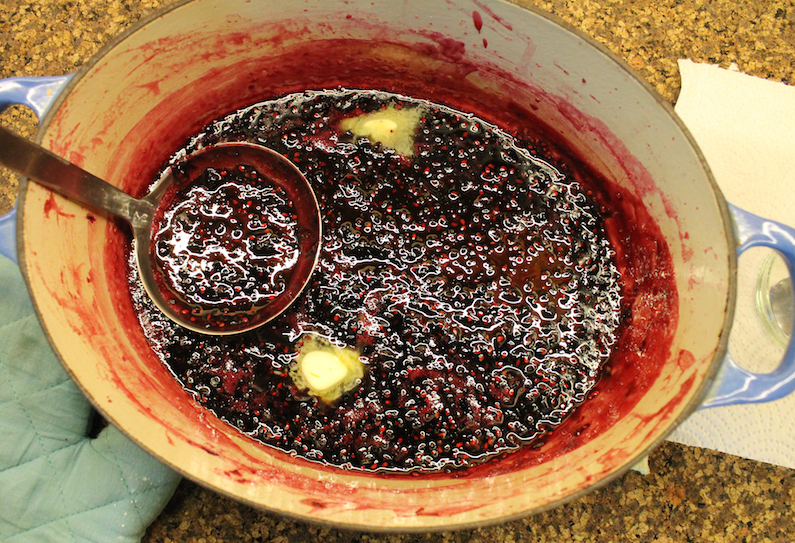 I love to make jams, preserves and chutneys. Maybe it's because I don’t live in the early 1900s and have to do it. Like homework, it’s always more fun to do if it’s not your own assignment, amirite? I can hardly imagine either of my grandmothers putting up just one jar of jam or chowchow at a time. They are probably tsk-ing at me right now. Dubai and the UAE in general have much more locally grown fresh produce available since I arrived six years ago, but except for dates, fruit is still flown in so it’s expensive. So much so that I cannot pass up produce when it is on sale, especially berries and summer fruit like peaches and nectarines. This week it was blackberries. I cooked them down into a quick jam – no pectin, just lemon juice and sugar – then because it is Muffin Monday, I used one-third cup to make these lovely muffins. So good! 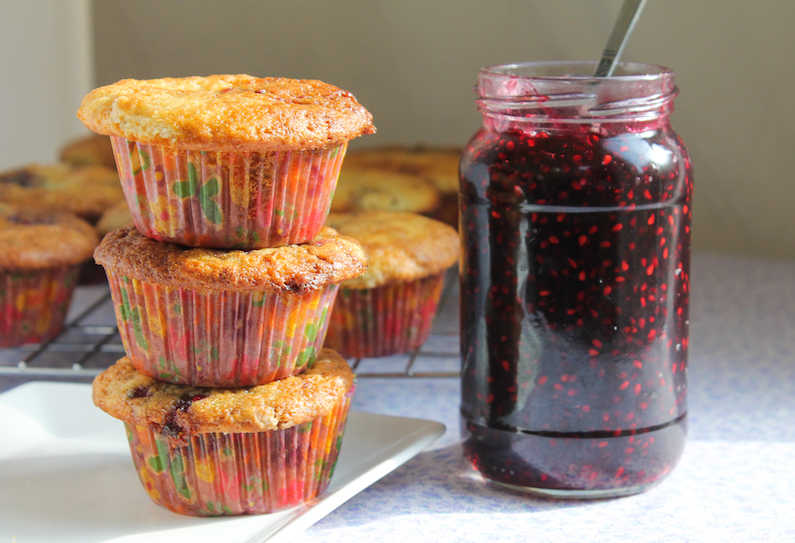 And, the best part is that once the muffins are gone, we will still enjoy blackberries for weeks to come. 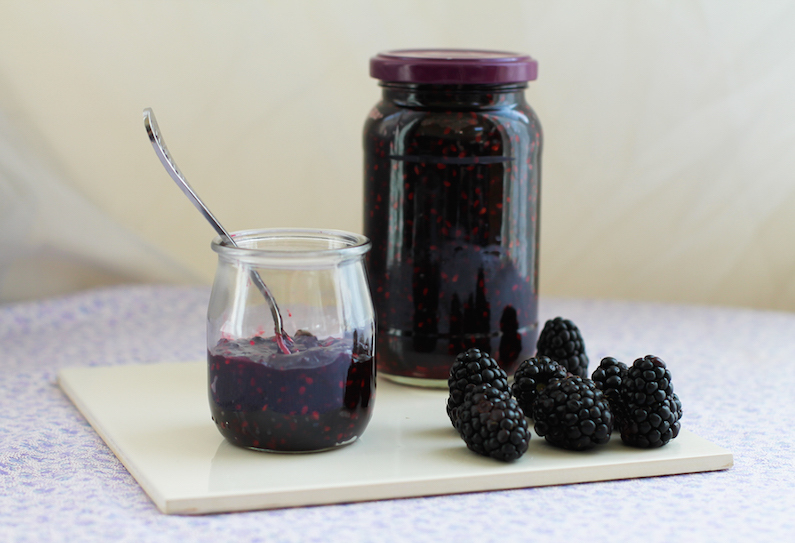 If you'd like to make my quick blackberry jam, find that recipe here. 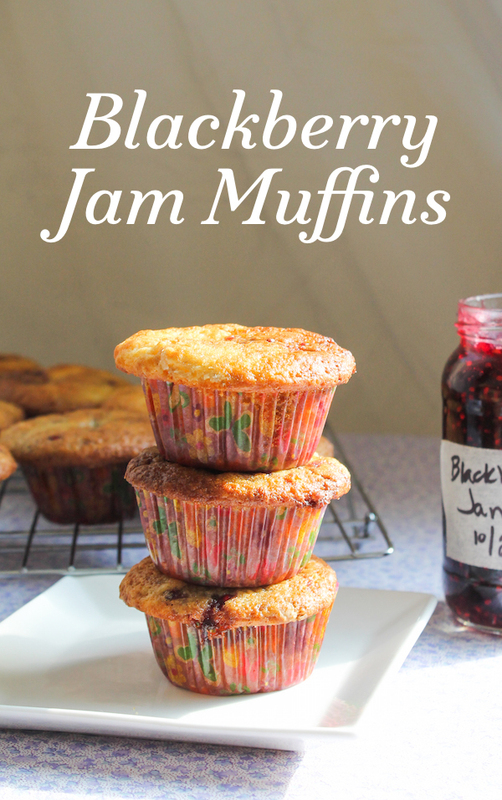 Combine my favorite easy quick bread breakfast muffin recipe with your favorite jam (or my quick blackberry jam) to make these delicious muffins for breakfast or snack time. 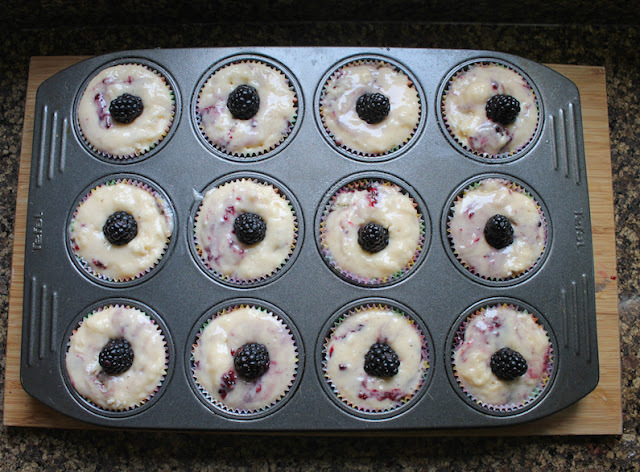 I topped each with an extra blackberry before baking. As you can see from the photos, they sank, making a little tart surprise in the middle of each. Skip that step if you’d like. Preheat oven to 350°F or 180°C. Generously grease cups and top of 12-cup muffin pan or line it with paper muffin cups. 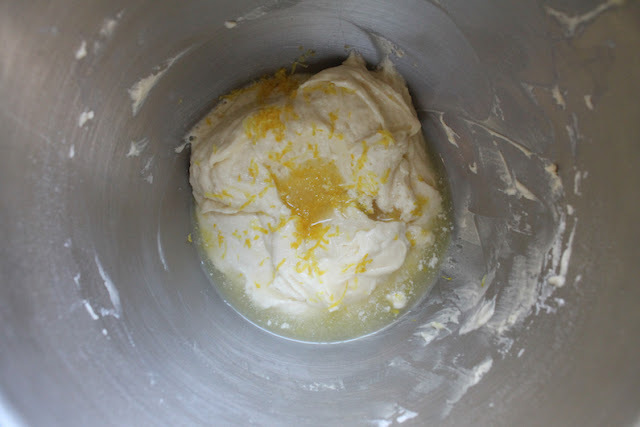 *Put your lemon juice in a measuring vessel and then add milk up to the 1 cup or 240ml mark. Set aside. Whisk your flour, sugar, baking powder, baking soda and salt together in a large bowl. In another bowl, whisk together your soured milk, oil and eggs. All at once, add the wet ingredients to the dry. Gently fold just until dry ingredients are moistened. There may be little bits of flour showing and that's just fine. Spoon the blackberry jam on to the batter, then fold it in. 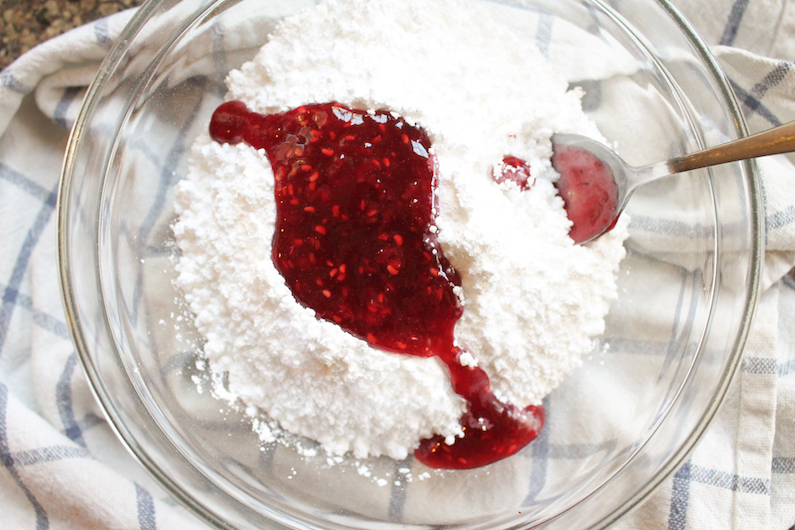 You want ribbons of jam, not a homogenous batter. Divide your batter relatively evenly between the 12 muffin cups. Top each with a whole blackberry, if desired. As I mentioned above, they sunk. I was hoping for a decoration on top but instead got a little surprise inside. All good either way. Bake the muffins for 20-25 minutes in your preheated oven, or until they are golden. 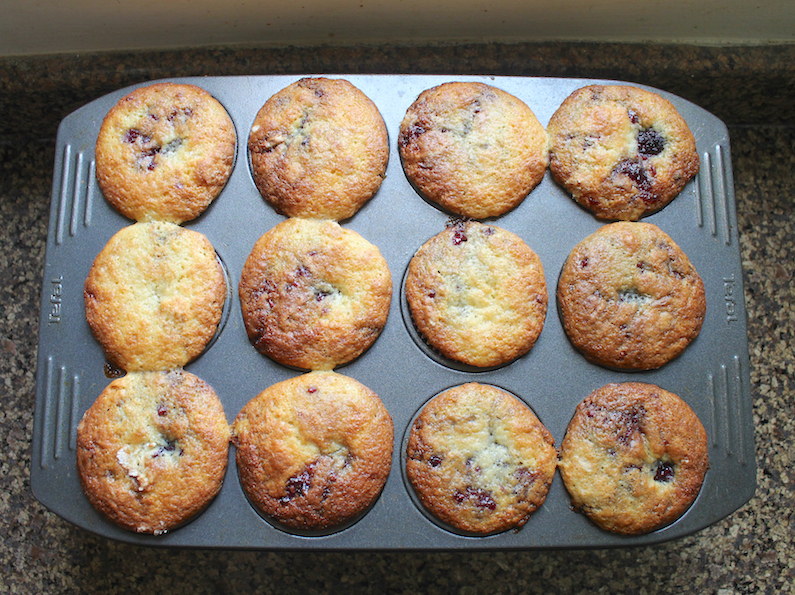 Remove the pan from the oven and let cool 10-15 minutes before removing muffins from the pan. 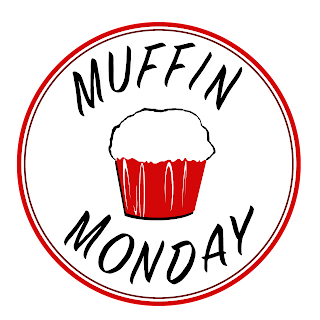 Check out all of the wonderful muffins my Muffin Monday group has for you today! Quick blackberry jam is so easy that you can have homemade jam in less than 25 minutes. Seriously. That doesn’t count cooling time but those extra minutes will teach you patience, young grasshopper. Good things do come to those wait! If you’ve ever let jam making scare you, this is the recipe you’ll want to try. First, it only makes one jar, so no huge commitment. Second, it only has three ingredients. And finally, but probably most importantly, it’s quick, easy and delicious. And P.S. It's also great in muffins. Get the muffin recipe here. 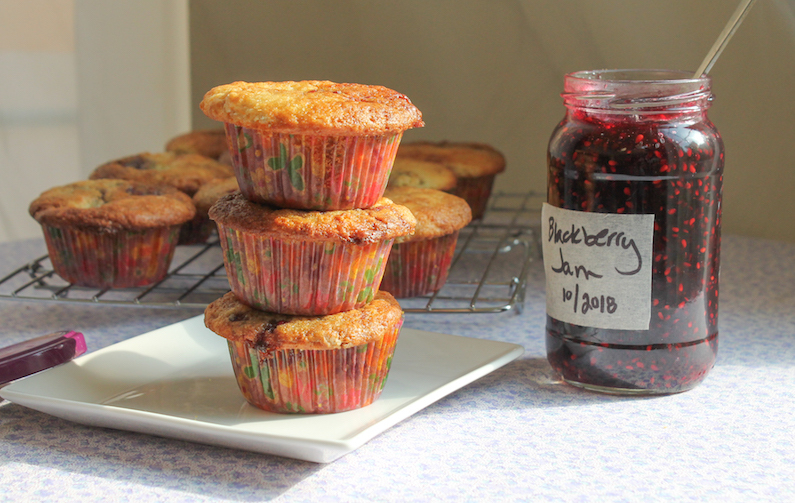 As I mention in my blackberry jam muffin post, I cannot resist berries on sale. 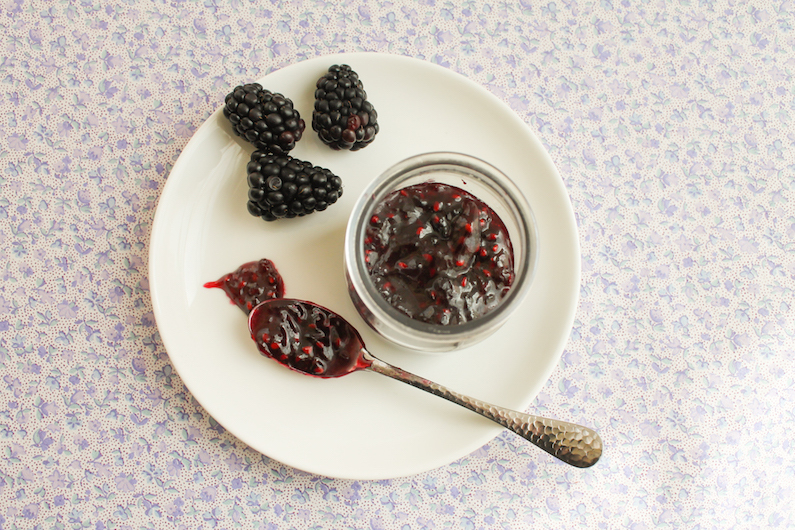 This quick blackberry jam extends their shelf life in a most wonderful, easy way. In your kitchen sink, sterilize one 2-cup or 480ml jar by putting a teaspoon in it and then filling it with just boiled water. Fill its lid as well. Leave to cool while you get on with the jam. I pour the boiling water over my ladle and jar funnel too, just to make sure it’s all sterilized. Once it’s cooled enough to handle, pour the water out of the jar and lid and leave to dry. 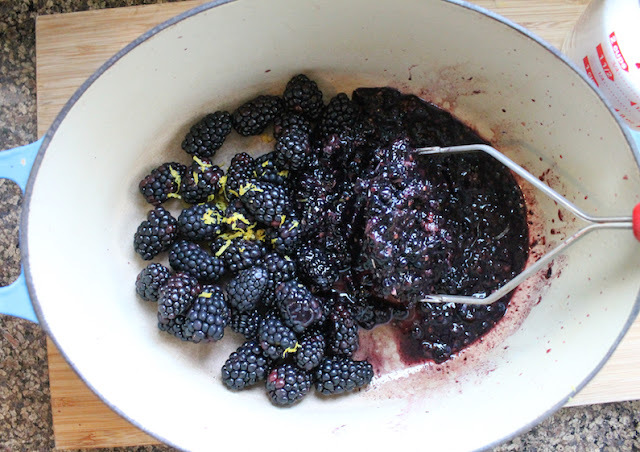 Put the clean blackberries in a heavy bottomed pot along with the lemon zest. Mash them with a potato masher until completely pulverized, occasionally using a sharp knife to cut them off of the masher grid. Add the sugar and lemon juice. Stir well. Put the pot on the stove over a high heat, stirring frequently, until it comes to a rolling boil. Boil for five minutes, skimming off and discarding any scum that appears with a spoon. Do not walk away from the jam at any time. 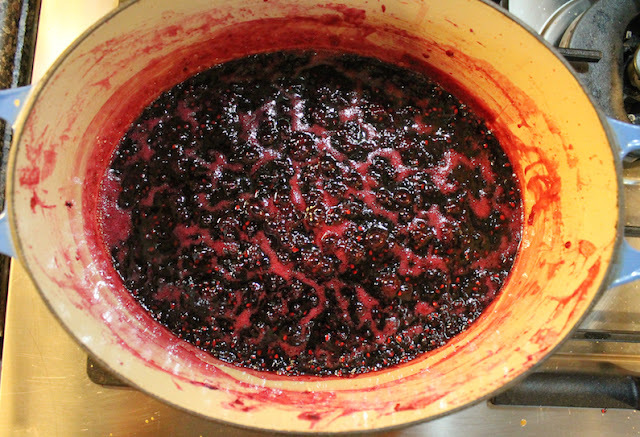 Reduce the heat to medium high and cook at a slow boil for an additional 12-14 minutes or until the jam reduces by about one-third in volume, continuing to skim scum if it keeps coming out. You really don’t need a thermometer for this quick jam but I like to watch the temperature rise. 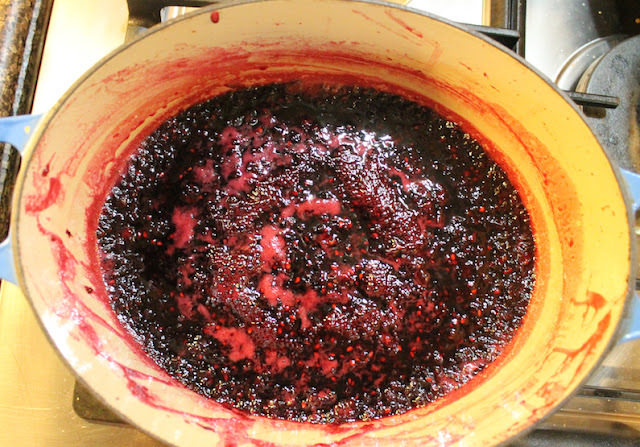 Supposedly for jam to set, it has to reach 220°F or 104°C. 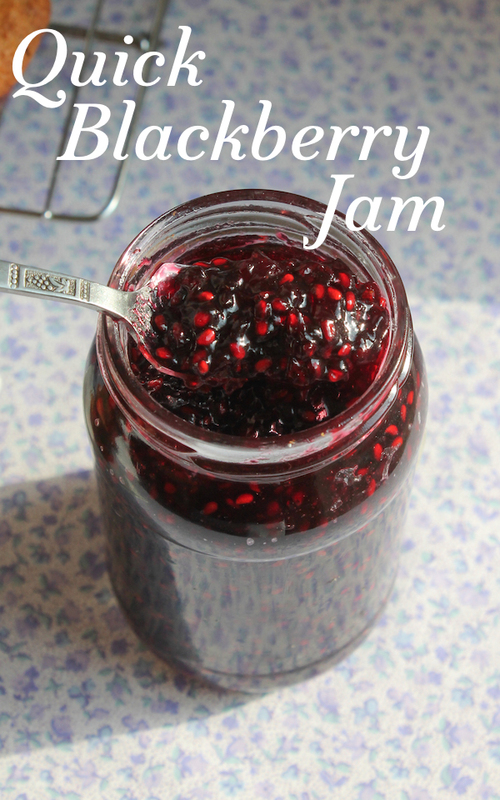 This quick jam did not but it set just fine. Remove the pot from the stove and add the butter. 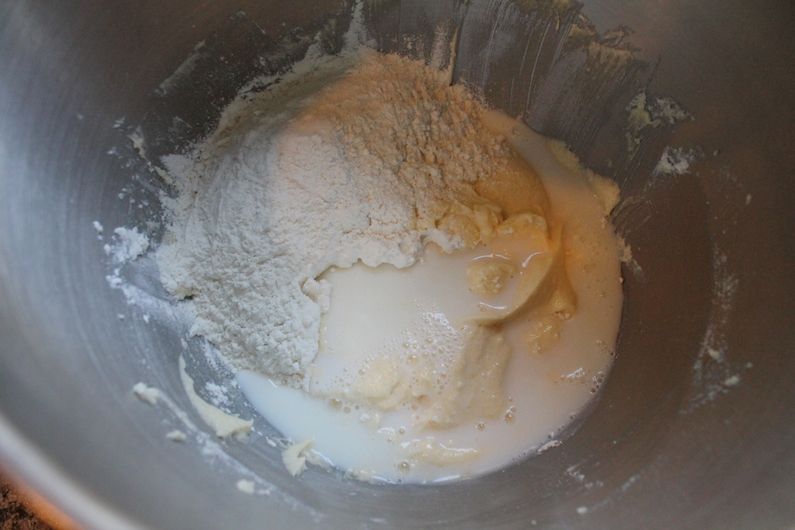 Stir well till the butter has melted completely. 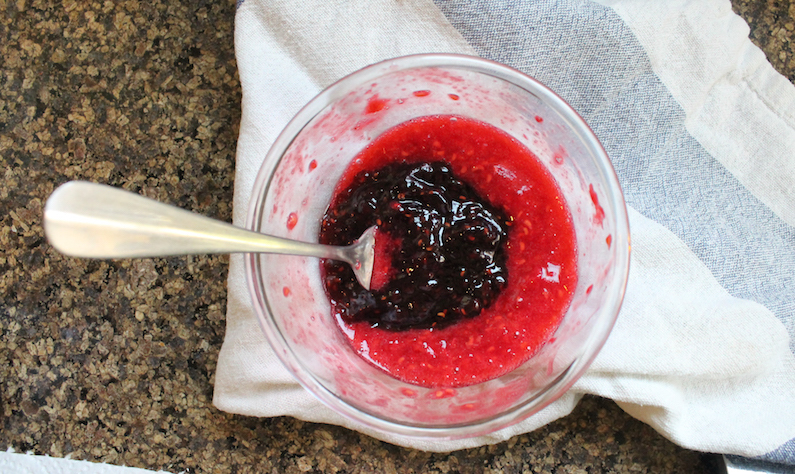 Using a clean ladle and funnel, transfer the quick jam to your jar. Screw the lid on tightly and turn the jar upside down. Leave to cool completely. Once cool, turn the jar upright and store in the refrigerator. 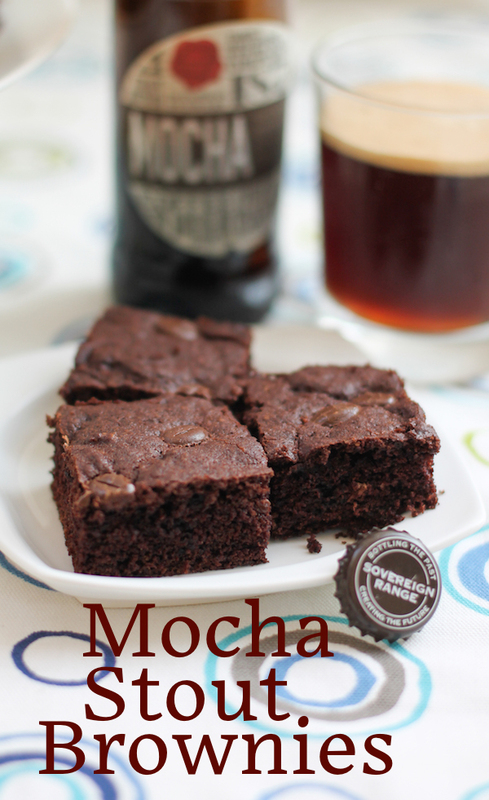 Mocha Stout brownies are rich and chocolaty with a subtle deep flavor from the stout. I used Bateman’s Mocha Stout which is available in Dubai, but you can substitute your own favorite local brew. Here in Dubai, as I’ve mentioned before, one must have a liquor license in order to purchase alcohol, including beer and wine. Because my husband travels a lot, always picking up bottles at duty free on the way home, we don’t go to the actual liquor stores that often. When we do go, I love browsing through the selection looking for odd bottles to use in cooking or baking. (Or cocktails!) This bottle of Mocha Stout was one such bottle. When I purchased it, I had no plans so it has been in the beer fridge for a while. This month our Creative Cookie Exchange leader, Laura from The Spiced Life, put forward Beer Cookies as our theme, saying maybe it’s “too out there.” A little weird, yes, but just search “beer cookies” and you get: About 320,000,000 results. I was game for the challenge. My daughter reminded me of that mocha stout and I got busy! Curious about the mocha stout? Here are the beer notes from the Bateman website. 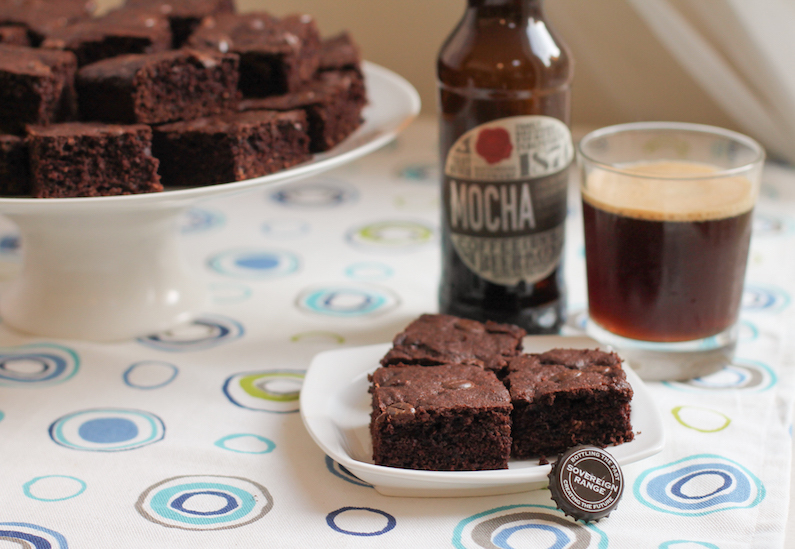 Mocha (6% ABV) - Winner of the Sainsbury’s Great British Beer Hunt, our Mocha is a coffee and chocolate stout sensation. 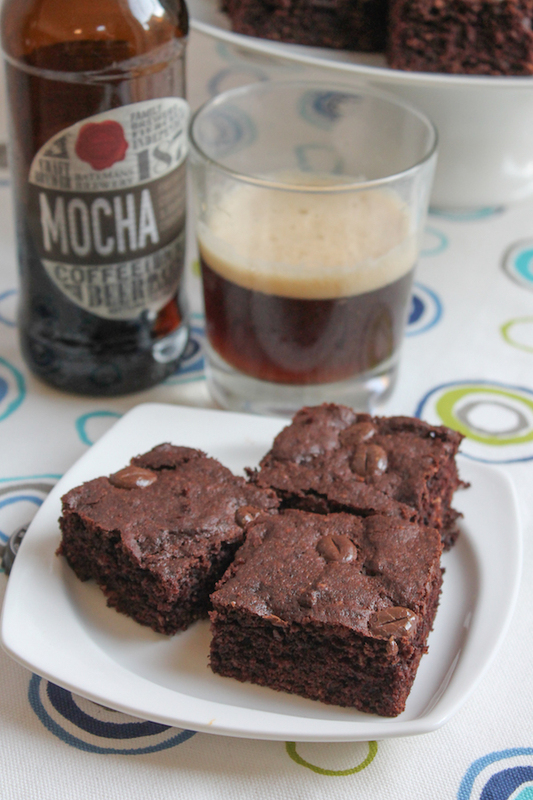 It’s brewed with genuine Arabica coffee, fine Belgian chocolate and locally grown, roasted barley malt. Rich, enticing and well rounded, the coffee and cocoa notes are certain to give your nose and taste buds a welcome wake-up call. Note: Just to be clear, I bought the mocha stout myself. This is not a sponsored post. Details included just for informational purposes. When it comes to brownies, there’s chewy vs cakey. I prefer chewy. My first batch of these turned out a bit dry aka cakey so I doubled down and added another egg yolk and less flour. Ahh, much better! 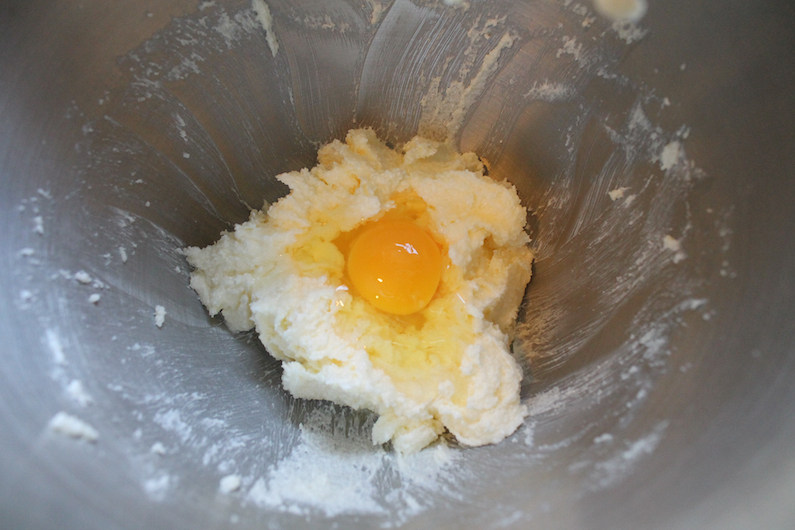 If you like yours cakey, omit the egg yolk and add an additional 1/4 cup or 31g more flour. I bought mine at Waitrose here in Dubai. UK readers, here’s the link. In the US, Walmart has something similar. I tried to find them on the actual Bayside Candy website without any luck. You could probably also use actual chocolate covered coffee beans sold all over the place. Preheat oven to 325°F or 163°C. 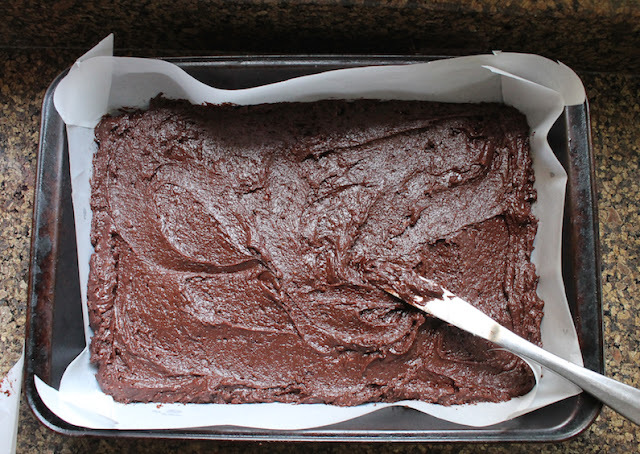 Line your 9x13 in or 22.5x33cm pan with baking parchment. I put a little butter on the pan under the parchment which keeps it from slipping around. Measure your sugars, cocoa powder, baking soda, baking powder and salt into a large mixing bowl. Whisk to combine. Add in the melted butter and whisk again to combine. 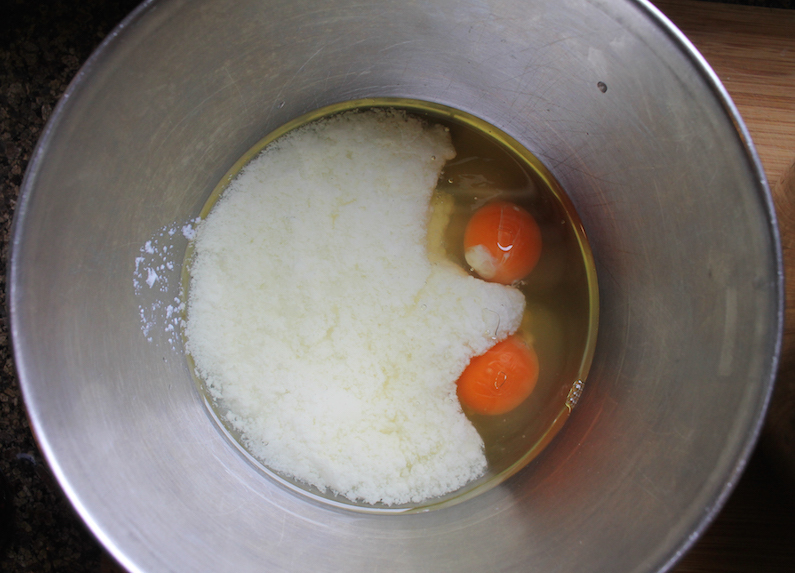 In another smaller bowl, whisk your whole egg and yolk. 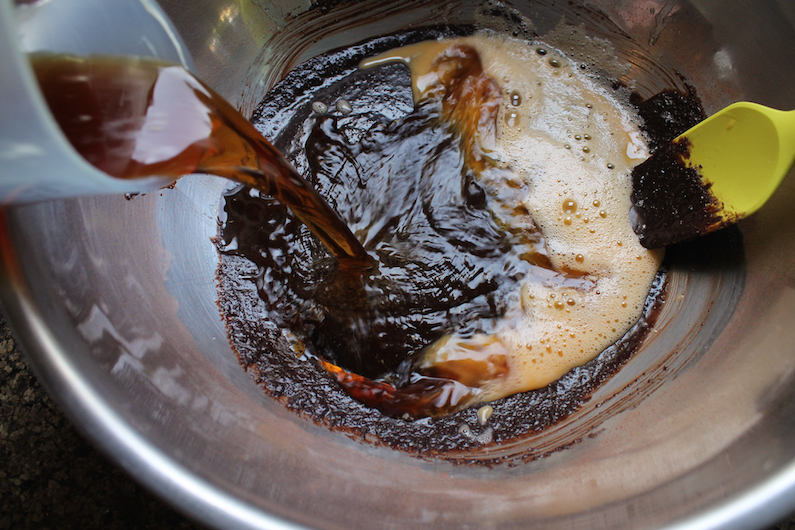 Add the egg and stout to the large mixing bowl and stir until well combined. 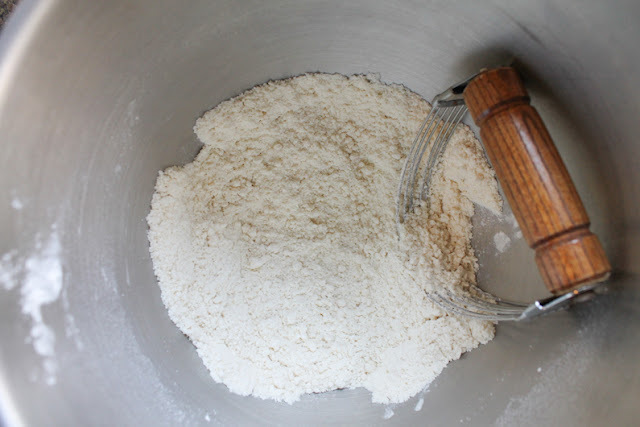 Fold in the flour, stirring until just combined. Spoon the batter into your prepared baking pan and smooth the top out with a clean knife. Sprinkle on the chocolate coffee beans, if using. 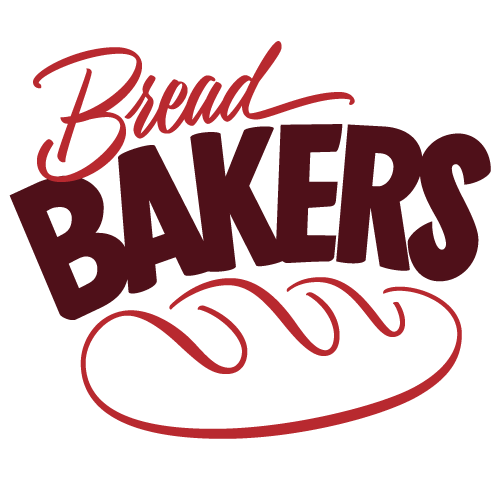 Bake in the preheated oven for 25-27 minutes or until the top is slightly firm to the touch. Allow to cool completely. Cut into 24 even squares. It's October, a month well-known for a rise in beer consumption! 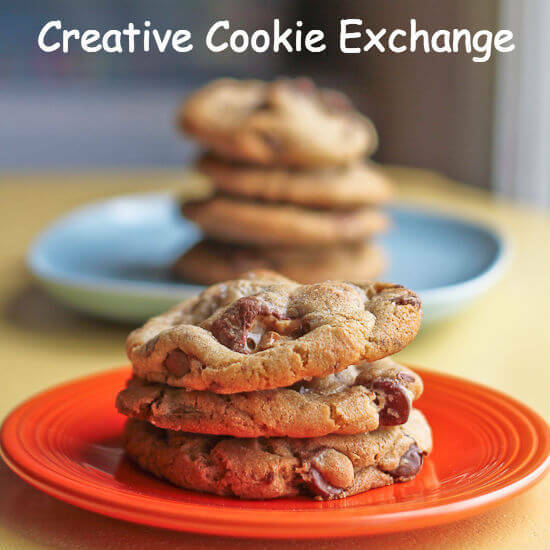 At Creative Cookie Exchange we couldn't resist doing our part to help. 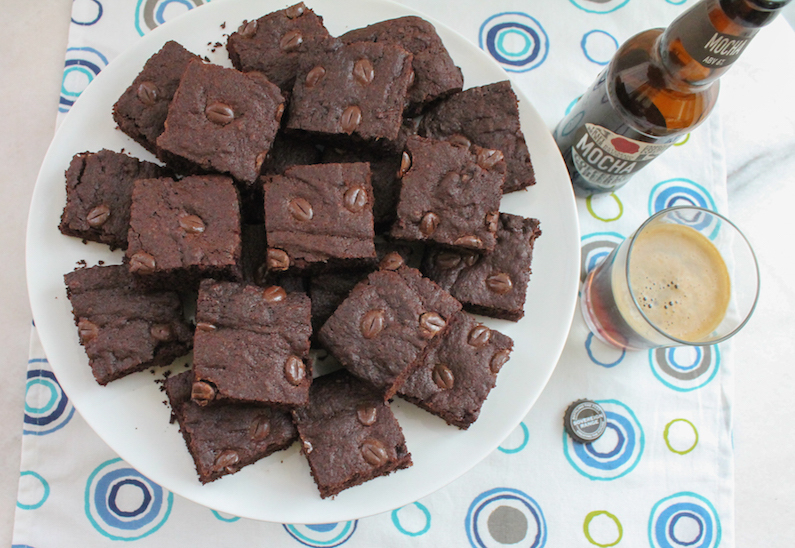 Check out the other beery cookies and bars we have for you today! Spicy shrimp stuffed squid salad says it all. 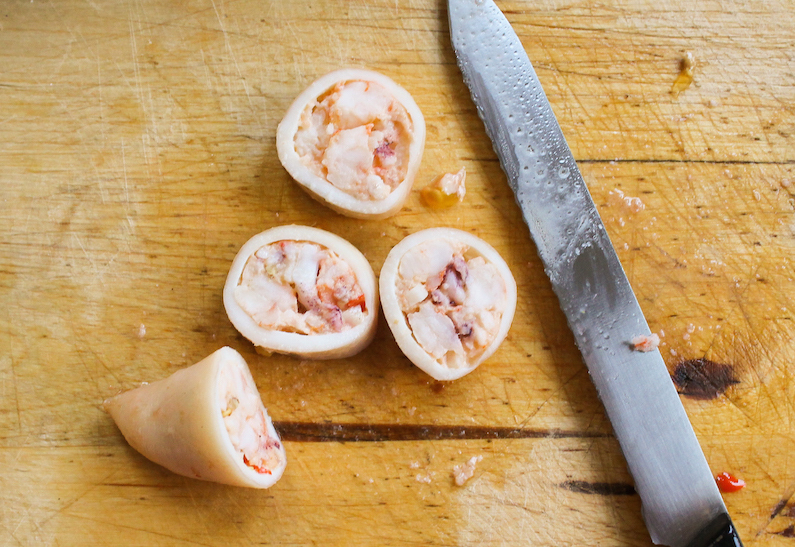 Shrimp, chili peppers, garlic and cheese are stuffed into clean squid and baked! 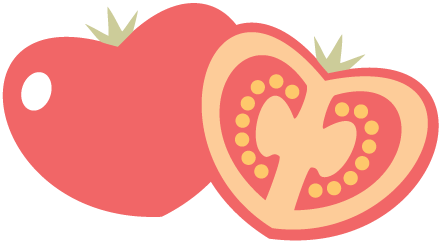 Once sliced, these beauties make a tasty colorful addition to a fresh tomato salad. This salad looks fancy, if you have special guests that need impressing, but it’s really quite easy to make. Way back circa 2005, we had a lovely gentleman builder named Dave Price supervising renovation work on our house in the Channel Islands. As I spent more time with Dave, I found out that master construction was not his only skill; he also did a lot of the cooking in his family. We’d discuss recipes and what memorable dish we’d made for dinner recently over many cups of strong tea. When Dave told me about one of his specialties, stuffed squid, I couldn’t wait to write it down and try it. Squid are so perfectly stuff-able! Why hadn’t I thought of that? This month I am the host of Fish Friday Foodies and our theme is seafood stuffing. When I created the event, I was thinking along the lines of seafood that would be stuffed into something else, like a crepe, taco or baked potato. 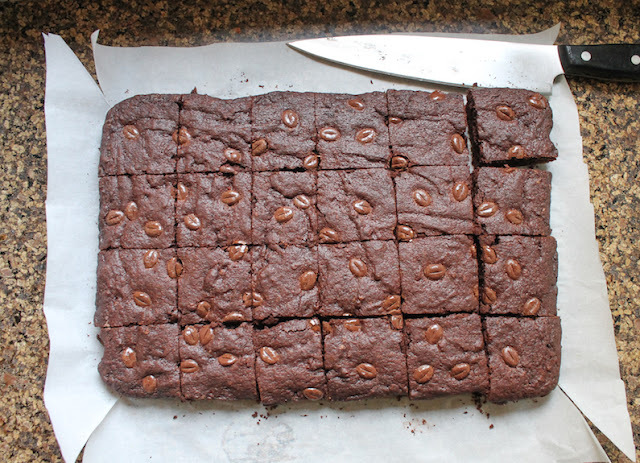 But as I shuffled through my old files, I knew I had to share Dave’s recipe. 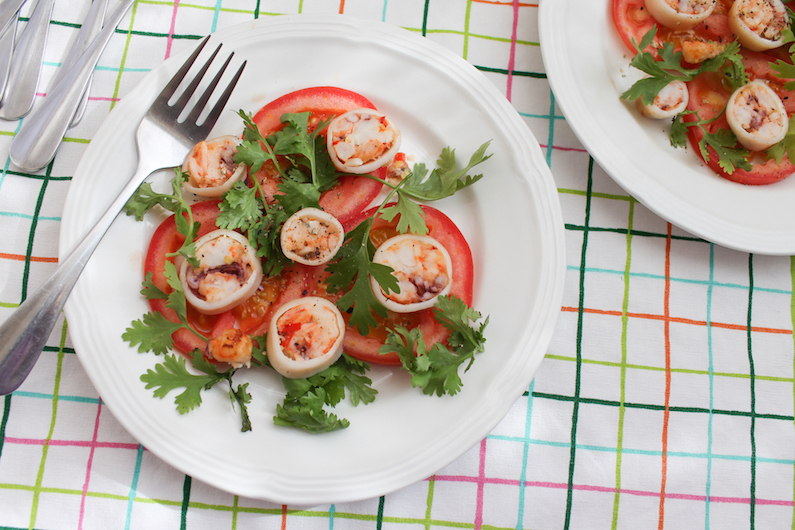 I can’t recall if he said what he served the stuffed squid with but I decided to add it into a fresh tomato salad. 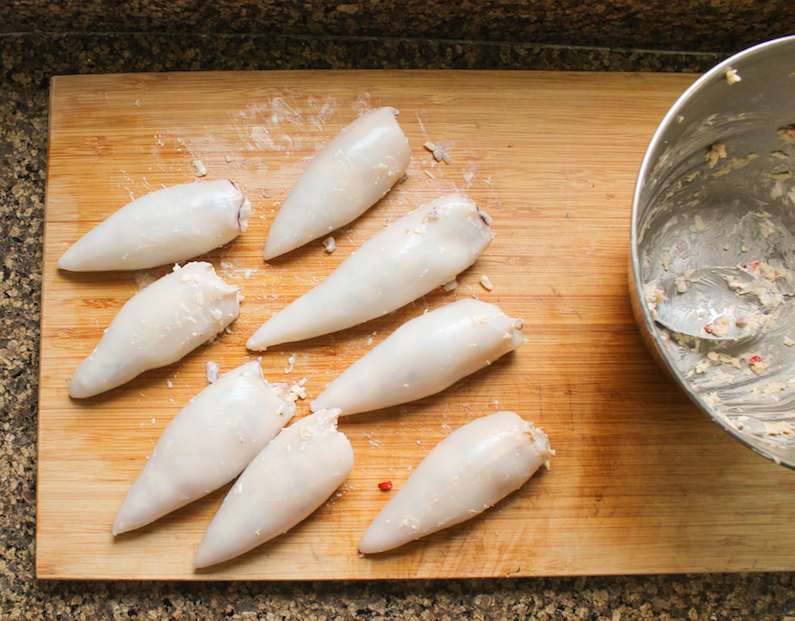 Dave’s original instructions called for one 6-inch squid per person. Mine were much smaller so I bought eight, but the size really doesn’t matter that much since we are going to slice them anyway. Use what you can find. This serves 2-3 people as a main or 4-5 as a starter or side dish. 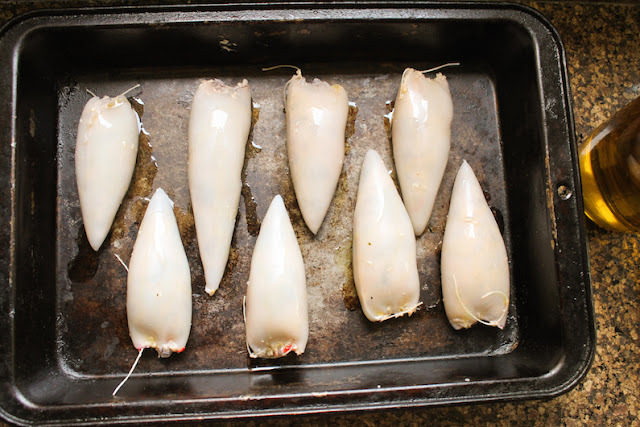 Clean each squid, first removing the head, tentacles and cartilage (cuttlebone) from the tube. 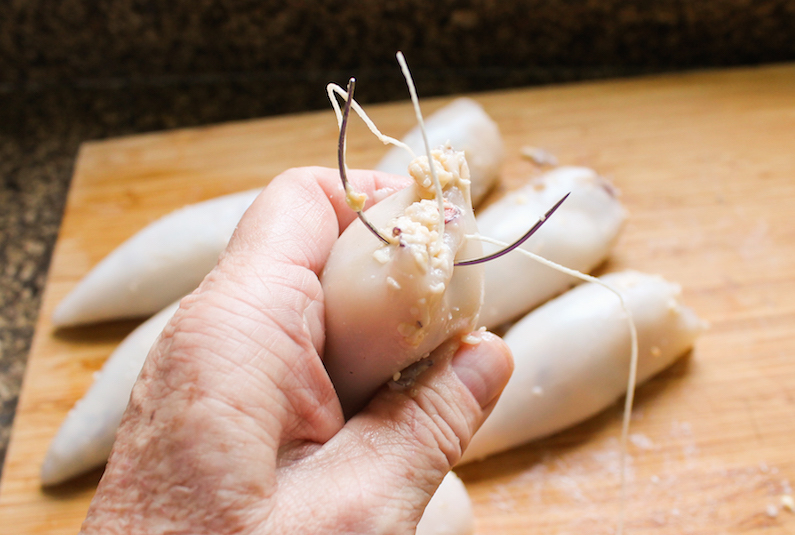 Use a sharp knife to cut the head away from the tentacles and discard it. Remove the beak from the tentacles and discard. Rub the outer colored film off of the tube with a dry paper towel. It should rub off quite easily. Run the tubes under cool water and make sure they are clean inside. Set aside to drain. If you need visuals of the cleaning process, check out this thorough post on The Spruce Eats. 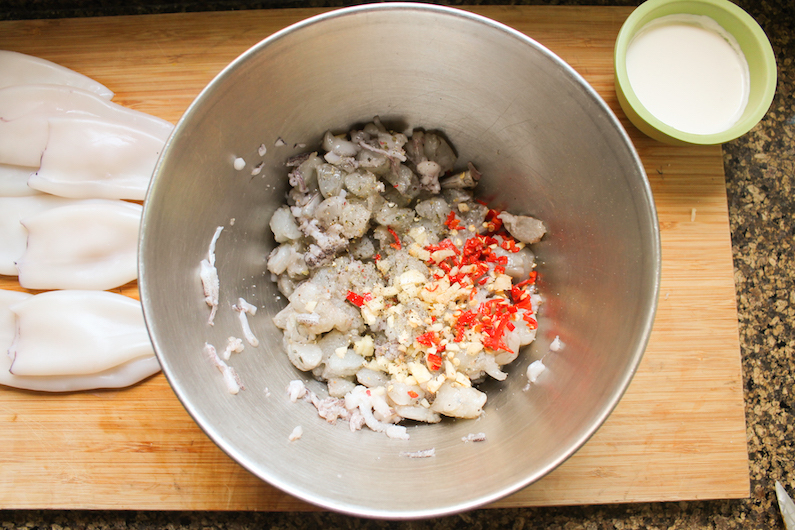 Chop the tentacles and shrimp into small bits then mix them with the chili peppers, garlic, salt and a few good grinds of black pepper. Add in the cheese and stir well. Mix in the sour cream. Stuff this mixture into your cleaned squid tubes. Sew up the opening with poultry string and tie a knot to keep it from coming open. I use a semi circular needle, which makes it easy to catch both sides of the squid as you stitch. 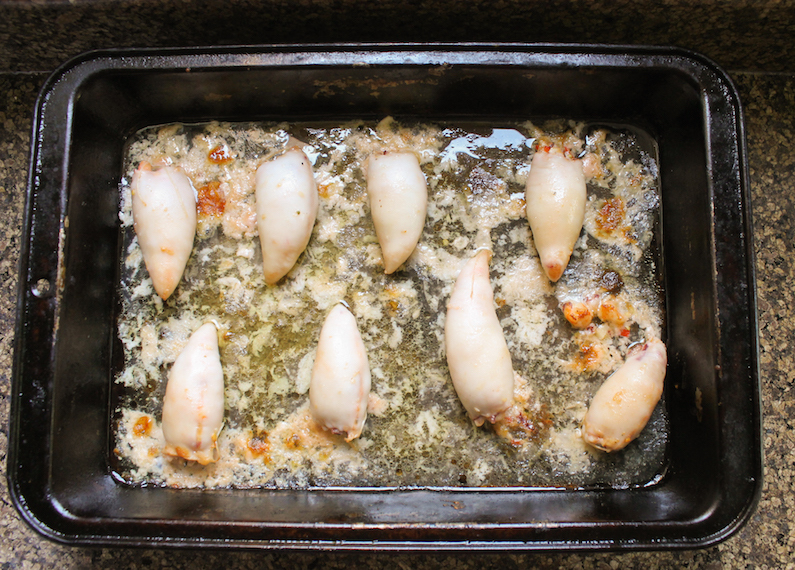 Put the shrimp stuffed squid in a baking pan and drizzle them with the olive oil. 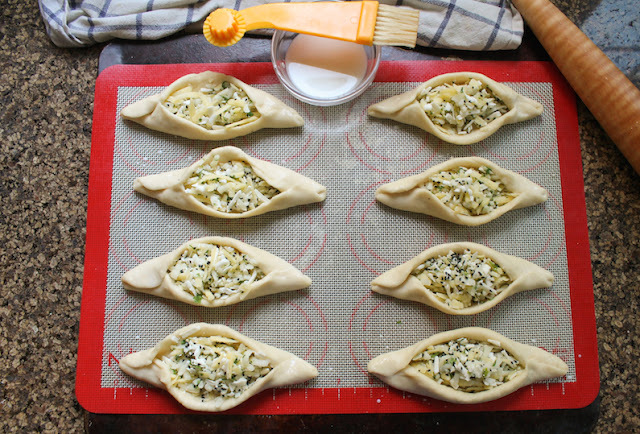 Bake them in your preheated oven for about 20 minutes. They will release a lot of beautifully flavored liquid. 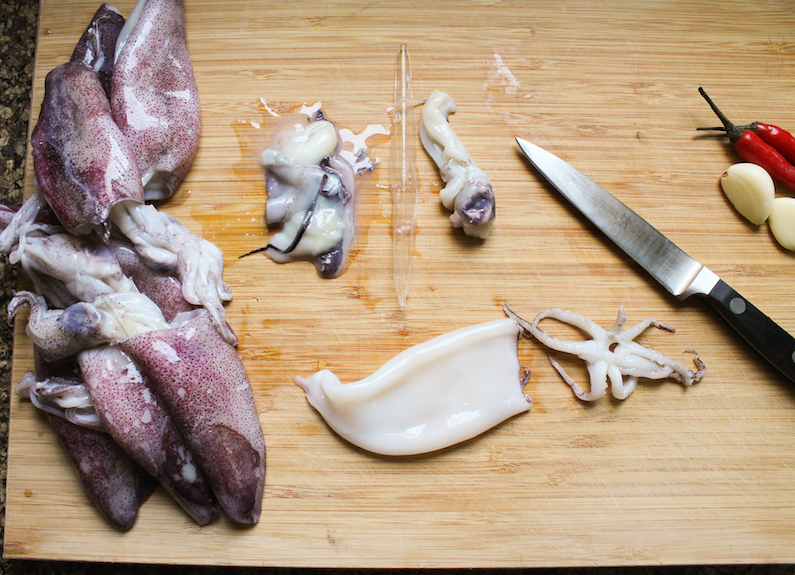 Remove the squid to a cutting board and leave to cool. Save any bits of shrimp that managed to escape. 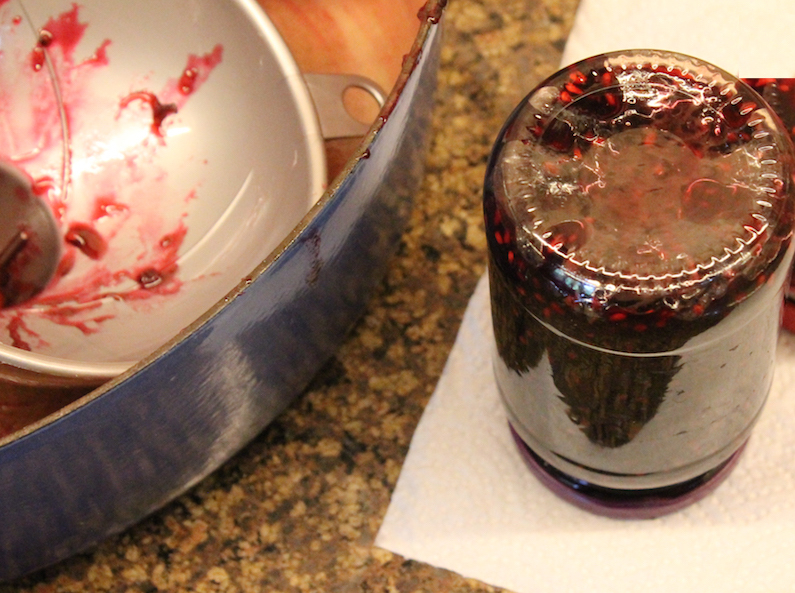 Strain the juice from the cooking pan and put it in a small jar or jug. 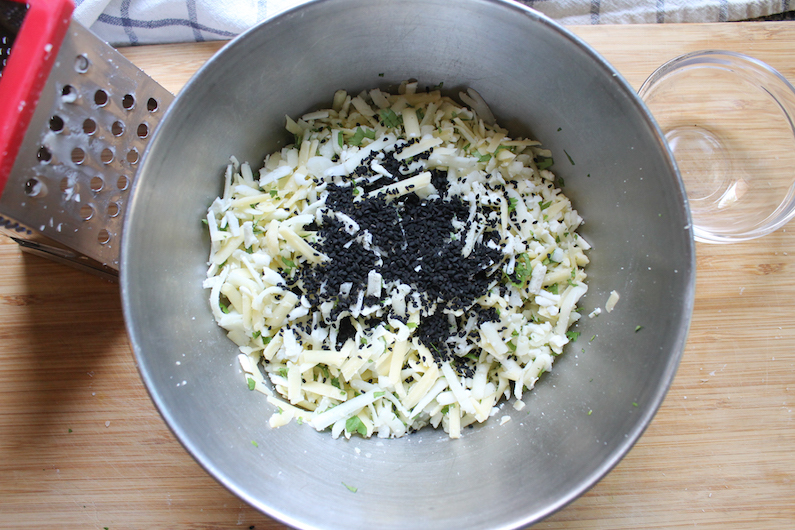 Once whisked, this makes a gorgeous dressing for the salad. Taste it and add a pinch more salt if necessary. Once the squid are cool enough to handle, use a sharp knife to cut them into circles. 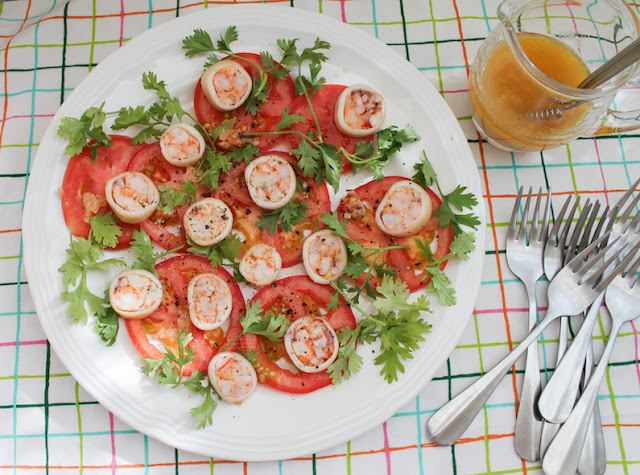 Arrange these on your sliced tomatoes, along with the cilantro and any salvaged shrimp bits. Whisk the dressing again and drizzle it over the tomatoes and squid. 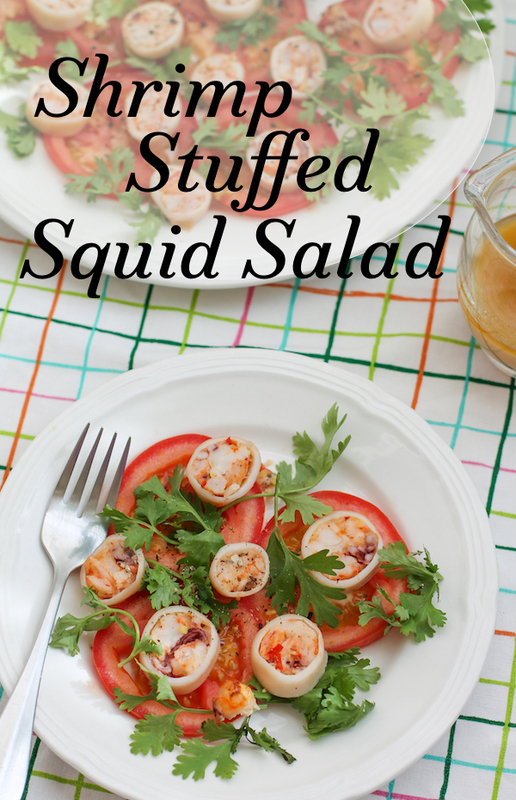 Check out the other seafood stuffing recipes my Fish Friday Foodie friends are sharing today! Would you like to join Fish Friday Foodies? 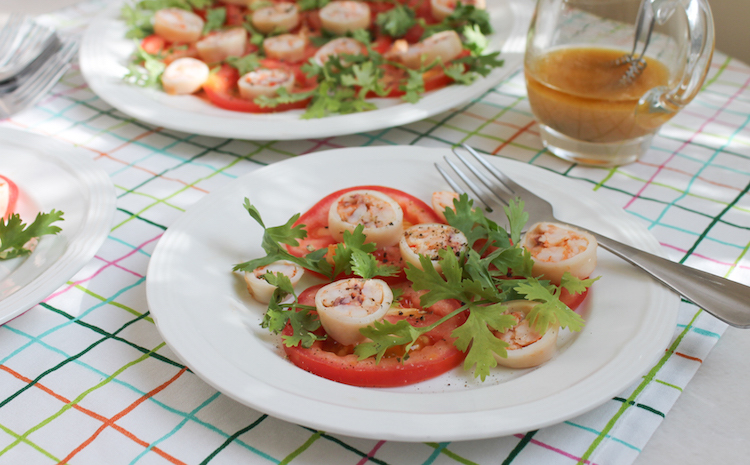 We post and share new seafood/fish recipes on the third Friday of the month. To join our group please email Wendy at wendyklik1517 (at) gmail.com. Visit our Facebook page and Pinterest page for more wonderful fish and seafood recipe ideas. 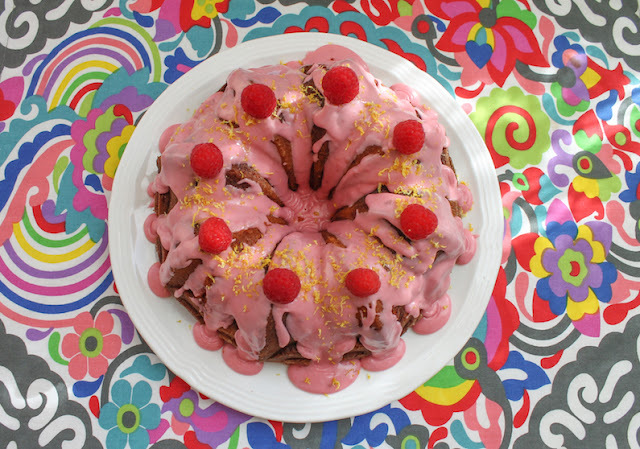 Layer a tangy lemon batter with a zippy pink raspberry batter and give them a swirl to create this lemon raspberry marble Bundt cake. The crumb is light but buttery. The lemon raspberry glaze adds a delightfully tart sweetness, or just sprinkle with a little powdered sugar to serve. 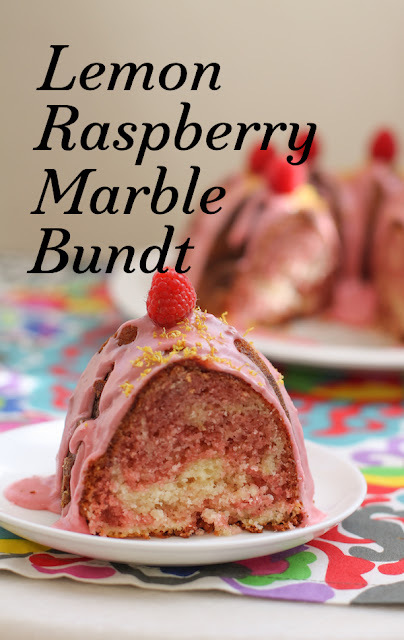 This month’s Bundt Baker theme is marble cakes which, in case you are not familiar, means two (or even three) batters, all swirled together in one cake pan. 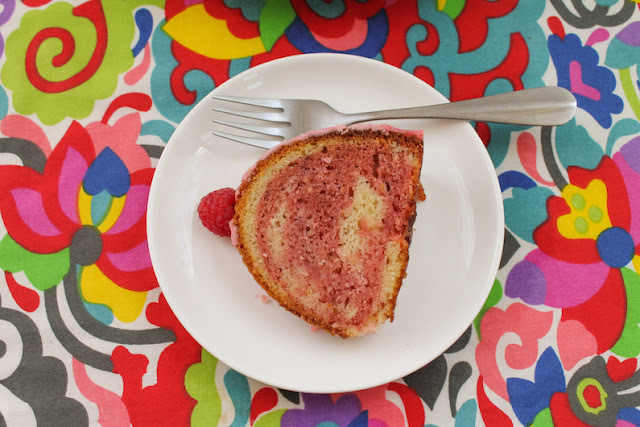 Ideally the cut cake shows off the different colors when baked and cut. 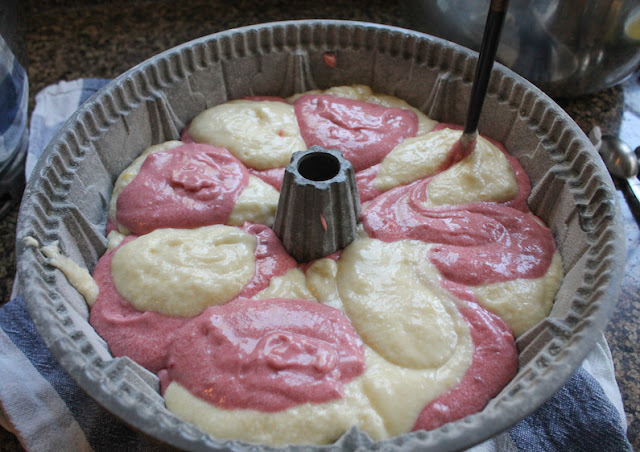 The trick, I think, is not to swirl too vigorously and to make sure your batters are contrasting colors. 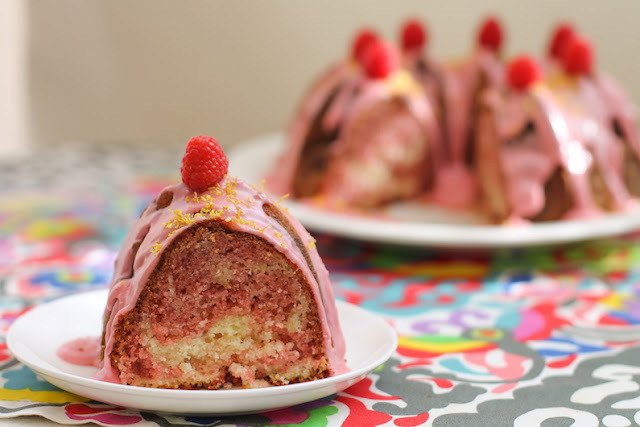 The most popular recipes when one searches for marble cake are vanilla and chocolate, which surely provide the most definitive contrast but I wanted to go a different direction. For the last week or so, my mind has been mulling the problem in the background, even as I get other things done. I’m special that way. The fresh raspberries available at my nearby supermarket clinched the deal. Lemon and raspberry it would be. The basic yellow cake batter recipe comes from my old favorite standby, Good Housekeeping Illustrated Cookbook, 1980 edition. 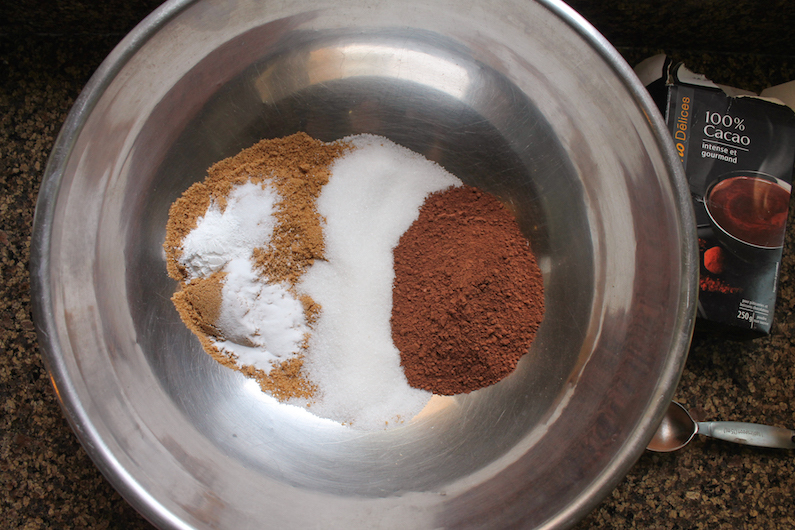 As both of my flavor additions are acidic, I also added baking soda, to help lighten the cake crumb. Preheat oven to 350°F or 180°C. 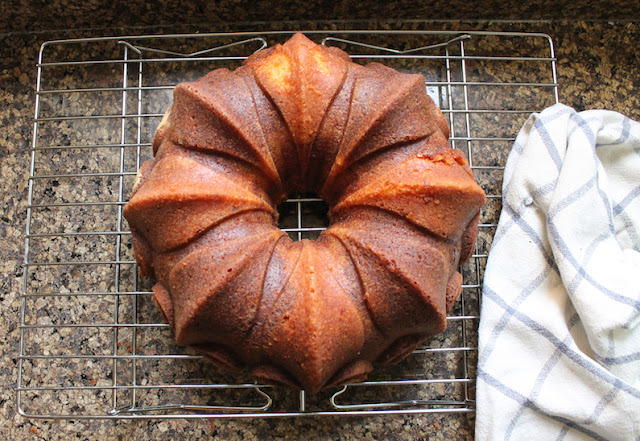 Grease a 10-cup Bundt pan with butter and then coat it with flour. 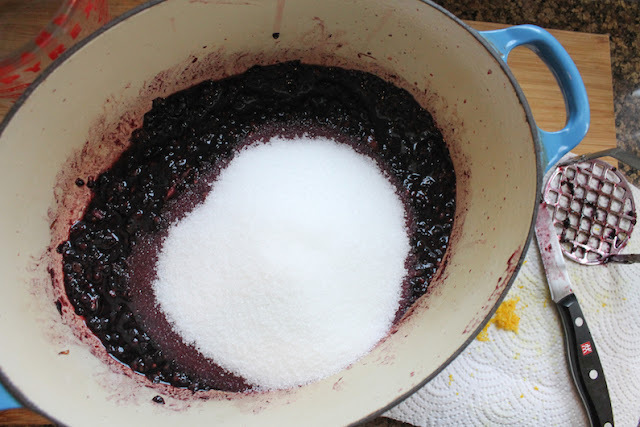 Once mixed, set aside two tablespoons to use later for the glaze. In large bowl, with your mixer on low speed, beat the sugar and butter just until blended. Increase the speed to high and beat 3 minutes or until creamy, occasionally scraping bowl with rubber spatula. Reduce speed to low again and the add eggs, one at a time, beating well after each addition. Beat in flour mixture alternately with milk mixture, beginning and ending with flour mixture just until blended, scraping bowl occasionally. 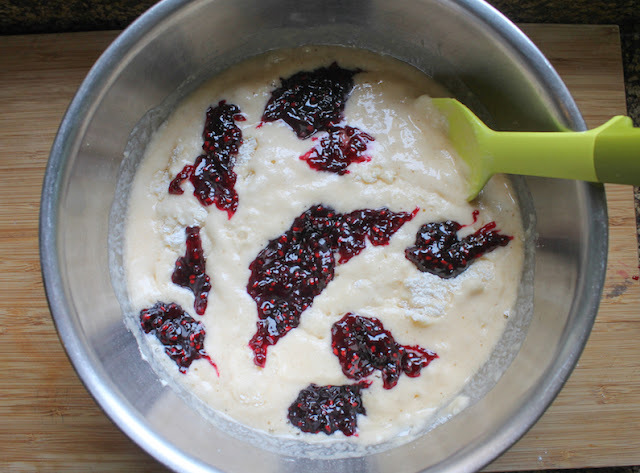 To one bowl of batter, add your raspberry mixture and fold it in till it’s completely combined. 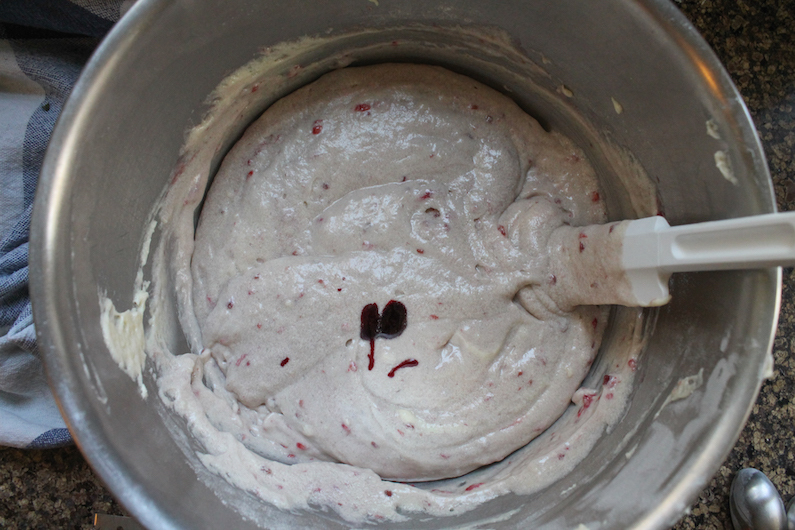 Since a marbled look is our goal, I also added about a 1/4 teaspoon of Wilton No Taste Red coloring gel. Without it, the batter was a soft purple-y grey. No doubt it would be tasty but not necessarily attractive. I used a clean toothpick to scoop the gel out of the little bottle because it’s so sticky, then I put the gel-coated end of the toothpick into the little bowl with the raspberry mixture that will flavor the glaze. Add the fresh lemon juice and lemon zest to the second bowl of batter and fold them in till completely combined. 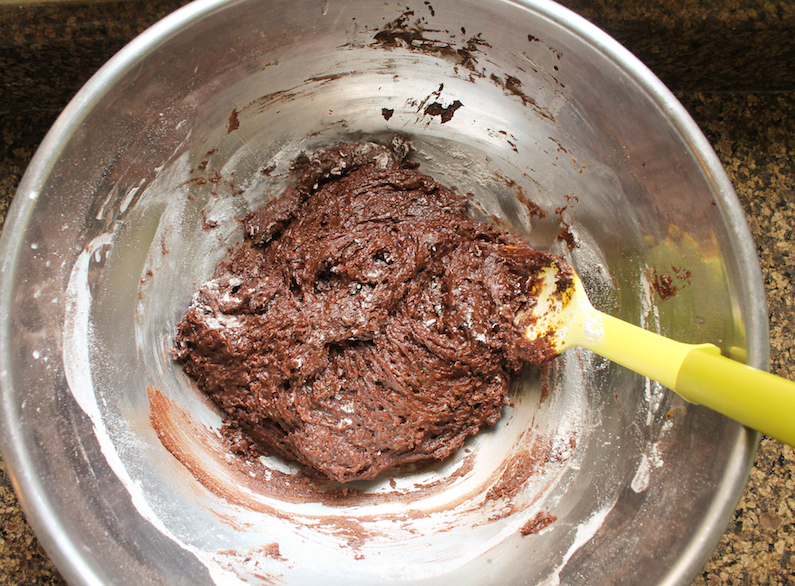 Using two tablespoons, alternate dropping spoonfuls of batter into your prepared Bundt pan. 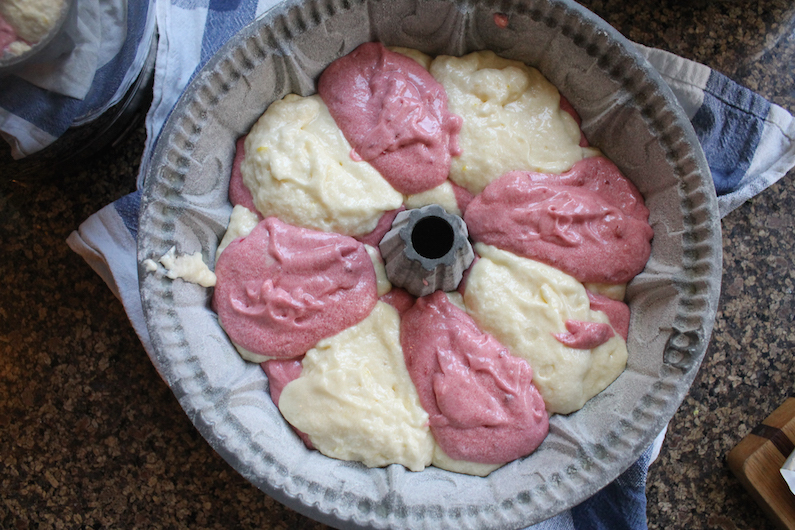 Keep layering the different batters, raspberry on top of lemon, on top of raspberry, etc. until they are both finished. 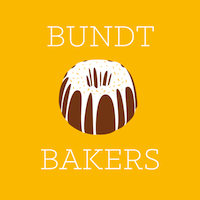 Using a wooden skewer or chopstick, gently swirl the batter from the middle to the outside and back again, around the Bundt pan. The batter is light and fluffy so it doesn’t take long to bake. About 35-40 minutes should do it or when the sides start to pull away from the pan and a wooden skewer comes out of the center clean. Set the Bundt pan on a wire rack to cool for about 20 minutes. Use the tip of your wooden skewer to loosen the edges of the cake from the pan then invert it onto the wire rack to cool completely before glazing. For the glaze, mix the powdered sugar with the reserved raspberry mixture and add the lemon juice a teaspoon at a time until you reach your desired consistency. I stopped at 3 teaspoons but really should have added more. As you can see, my glaze was very thick. But I’ve got to tell you, the raspberry flavor shone through! I was very, very pleased with that. A soft yeast dough filled with a blend of three salty cheeses, cilantro and nigella seeds, fatayer jebneh or Arabic cheese pies are baked till golden on the outside. The melted cheese on the inside is the perfect complement to the tender crust. 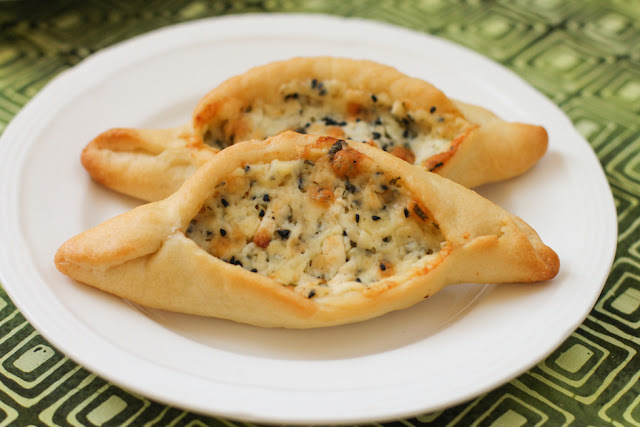 Fatayer jebneh are boat-shaped cheese “pies” that are a popular traditional snack in many Arabic speaking countries. 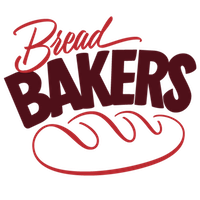 They are available not only in bakeries, but even supermarket deli counters will offer these convenient ready-to-go savory treats. When we first moved to Cairo back in 2012, I started searching online for a book about the city and its food traditions. I came across Apricots on the Nile* by Colette Rossant, originally published as Memories of a Lost Egypt. Ms. Rossant weaves a fascinating tale of her childhood along with sharing many recipes for favorite dishes. 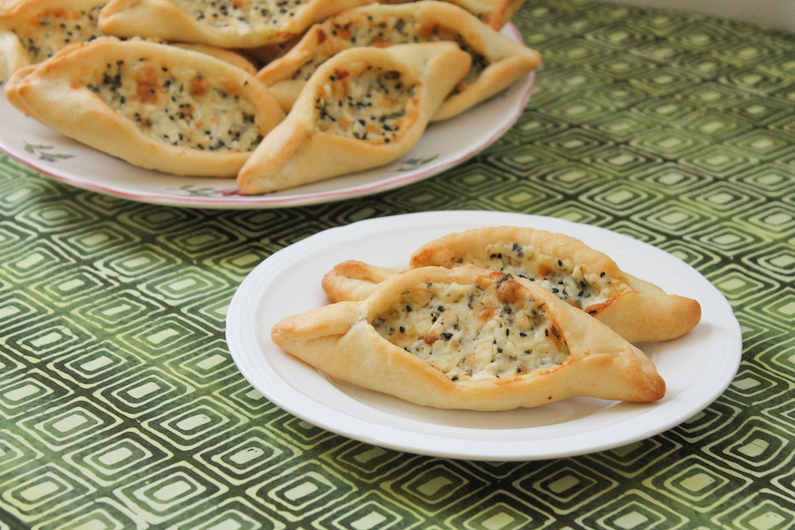 If you are interested in Egyptian cuisine, you might want to check out two other specialties I’ve made from Apricots on the Nile: Lahma Mashshiya or Beef Rolls with Onion Gravy and Sambusaks, another cheese-filled butter pastry but made without a yeast dough. Occasionally Ms. Rossant would mention a dish for which the recipe was not included, so I started searching online for food blogs that might fill the gap. 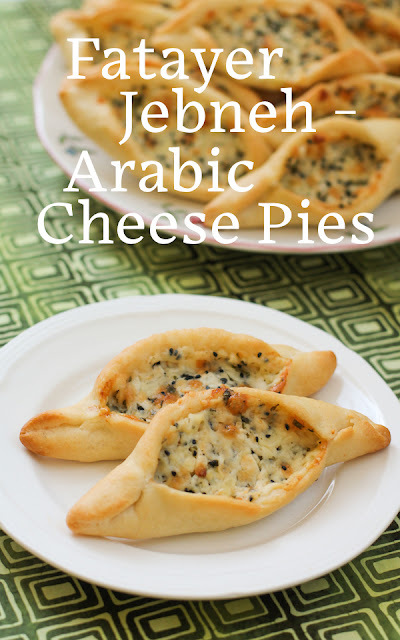 Despite living in Abu Dhabi years before, I found that I was woefully ignorant about much of Middle Eastern cuisine. One of my very favorites was called Chef in Disguise, written by a talented cook and photographer named Sawsan. As she says in her About Me, Sawsan is an orthodontist by day, a food blogger at night. A Palestinian who was raised in Jordan, she was passionate about sharing her traditional recipes – in English, thank goodness! – with the world. 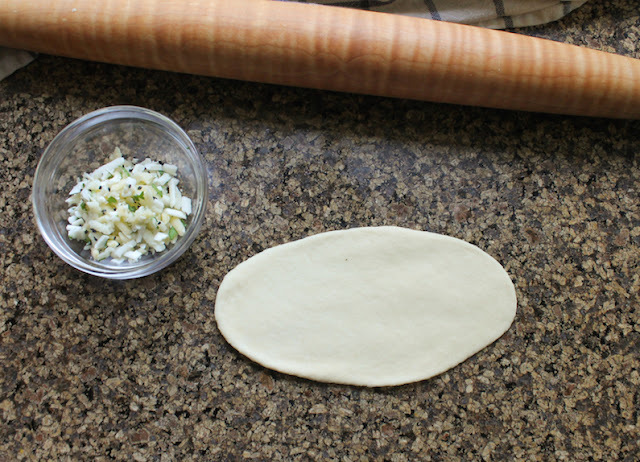 This recipe is adapted from Chef in Disguise. If you cannot find the akkawi or kashkaval cheeses, substitute another salty cheese like feta. 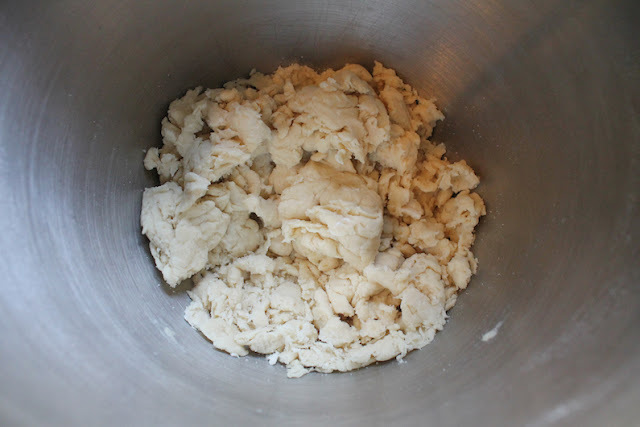 Note on flour: Here’s the thing about flour and making bread dough. 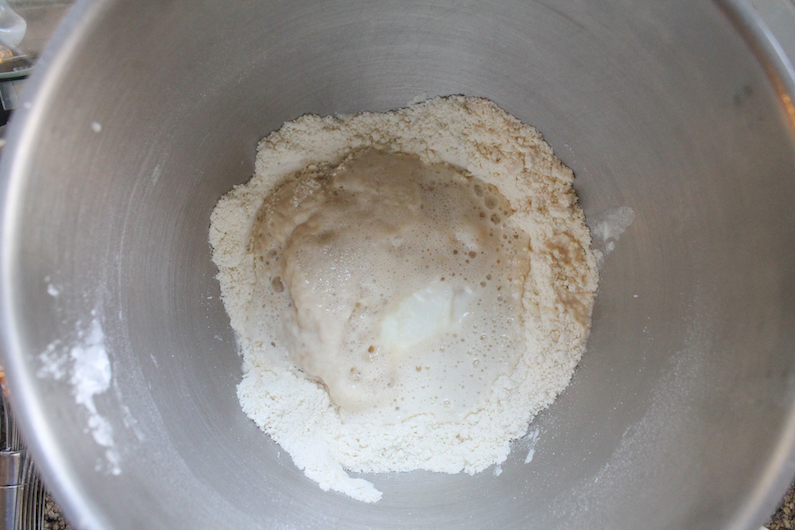 Sometimes, even if you measure your flour by weight, it might need more water when the dough starts coming together. 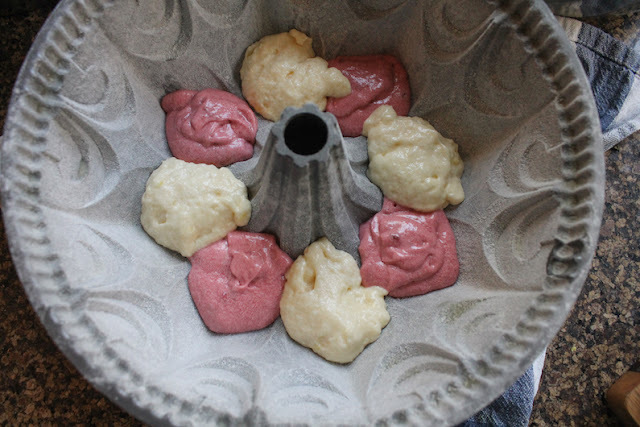 The first time I made this recipe, we were living in Egypt and the dough came out beautifully with exactly half a cup of warm water. I don’t know if the flour I can buy here in Dubai is drier – or maybe the air is drier? 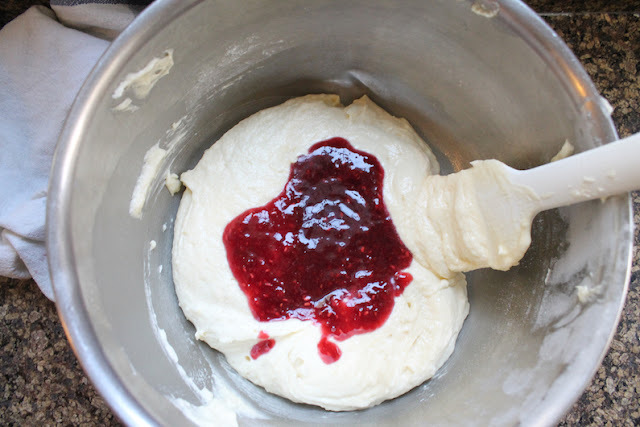 – but I had to add two tablespoons of water as the dough came together so it would hang together so I could knead it. Use your best judgement. 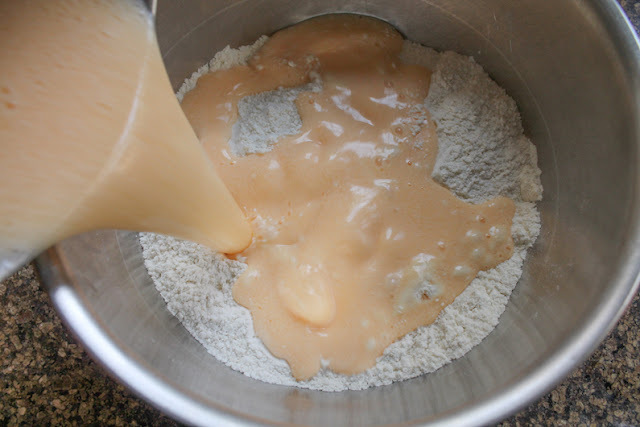 Add the yeast and sugar to a bowl or large measuring vessel then stir in the warm water. Set it aside until you need it again. You are looking for it to foam up, proving that the yeast is still active. If it doesn’t bubble up, buy new yeast and start again. 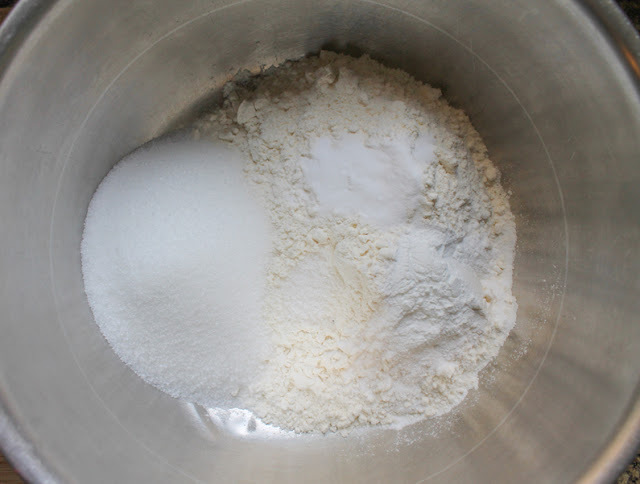 In a large bowl, whisk together the flour and salt till combined. This also helps aerate the flour and takes the place of sifting. 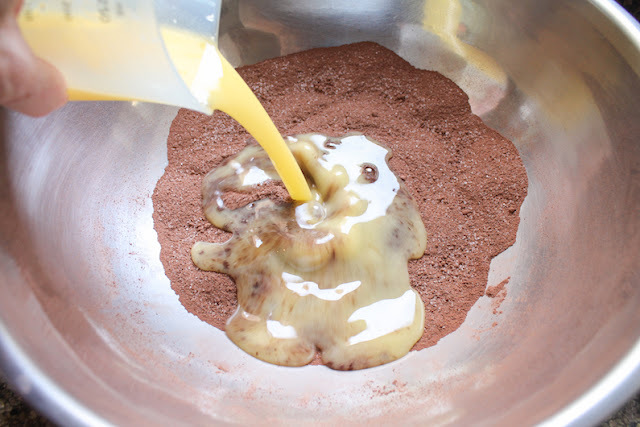 Drizzle in the oil and use a pastry cutter or your clean fingers to mix it in, creating a crumbly texture. Add the yeast mixture and the yogurt to the flour and mix thoroughly. I used my stand mixer at this point. You can certainly do it by hand, it’s just gonna give your arms a workout. After kneading, roll the dough into a ball and drizzle a little bit of oil into the mixing bowl. Put the dough back in and turn it so it’s well oiled. 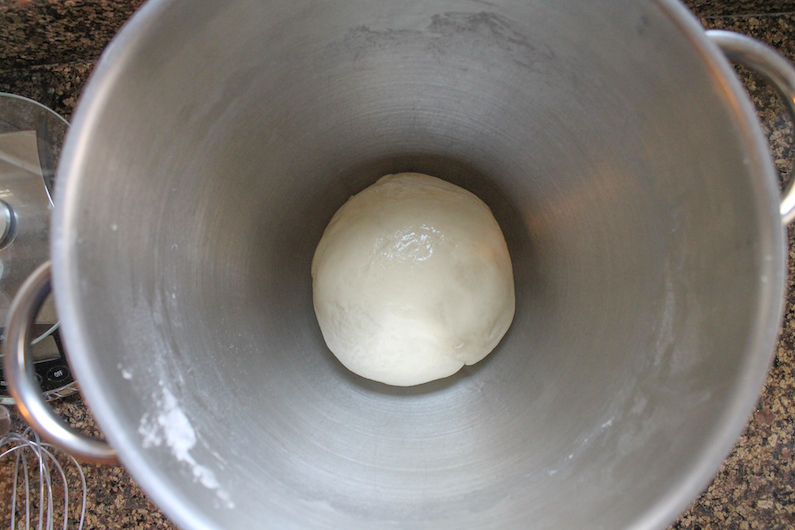 Cover the bowl with a damp towel and put it in a warm place for about an hour or until the dough has doubled in size. 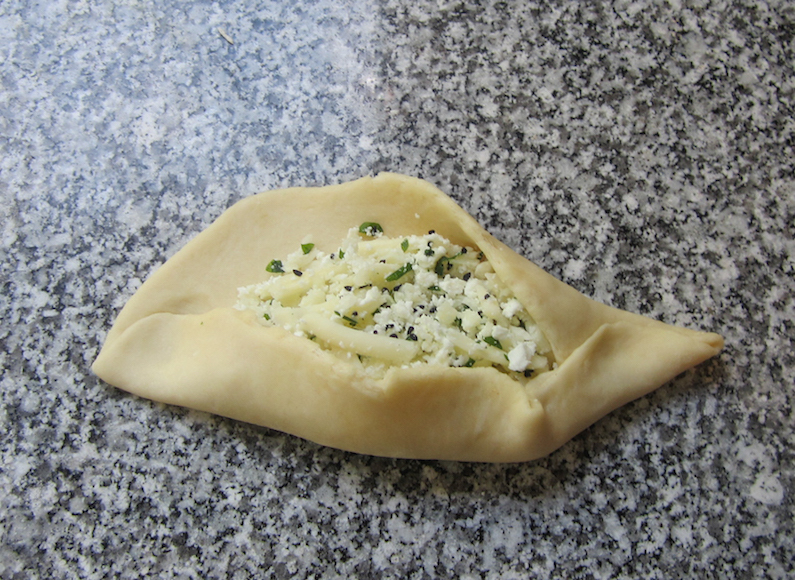 Traditional fatayer jebneh are a bit bigger than the ones I made, each starting with an egg-sized piece of dough. You can get about 10 of that size with this recipe. 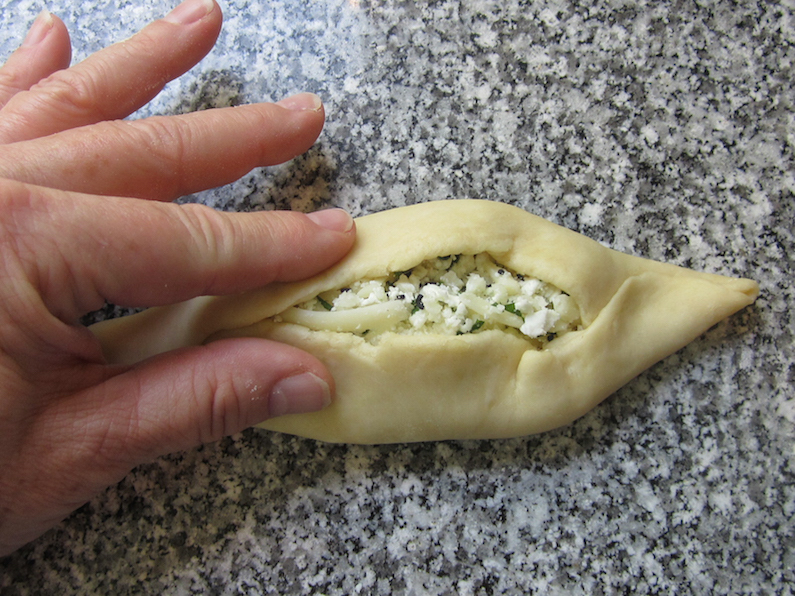 I find those a bit large, so I divide the dough into 16 pieces. 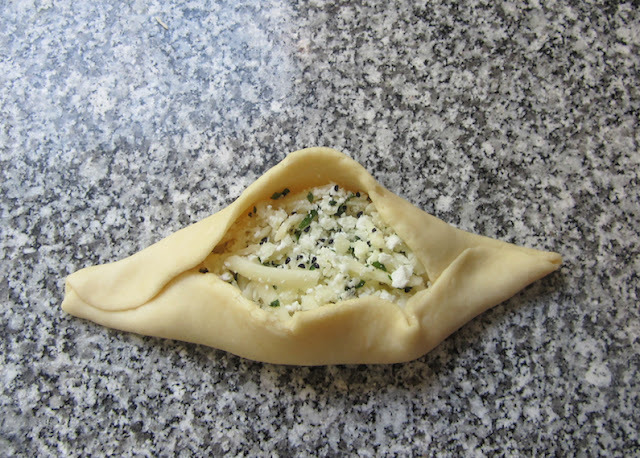 Either way, the cheese filling is enough since the smaller pies hold less cheese. 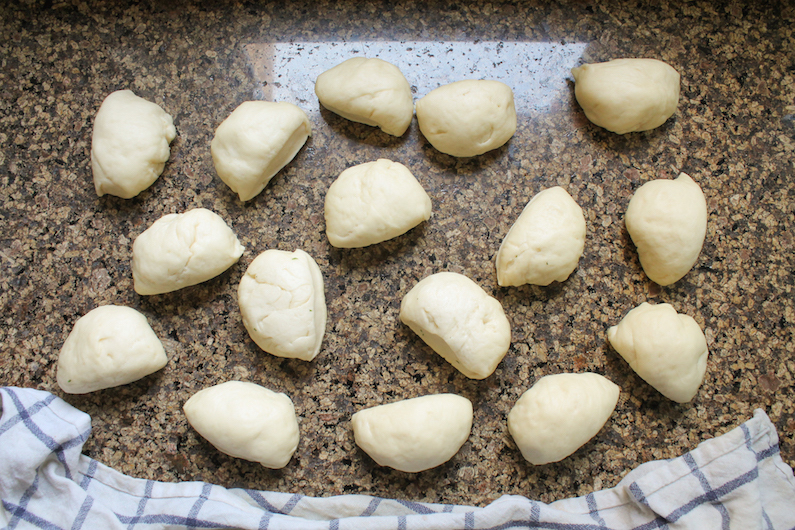 Divide your dough into either 10 or 16 small balls. Cover the balls with a clean damp towel and leave them to rest for 10 minutes. In a mixing bowl, combine the cheeses, chopped cilantro and nigella seeds. One at a time, roll each dough ball out into an elongated oval. 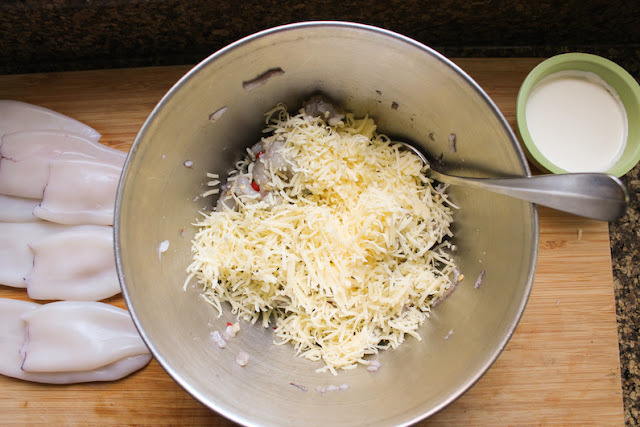 Fill the middle with the correct portion of cheese. For my 16 smaller pies, two tablespoons or (if you are a scale user) about 19g each worked perfectly. Brush the ends of the oval with a little water. Starting on the right side of the elongated oval, fold the far side toward you. Close that end by folding the near side back. On the left side, start by folding the near side back, then close that side by folding the far side forward. In other words, the two ends should be mirror images of each other. Use your fingers to press the sides of the gap together. Place the fatayer jebneh on a baking pan, leaving room for them to expand a bit while they bake. When the first pan is full, set it aside for about 15 minutes and preheat your oven to 400°F or 200°C. Meanwhile, roll, fill and form the rest of the pies. When the oven is hot, brush the fatayer jebneh with a little milk and pop them in the oven. I baked mine in two batches because I was still forming the second group when the oven was hot enough. 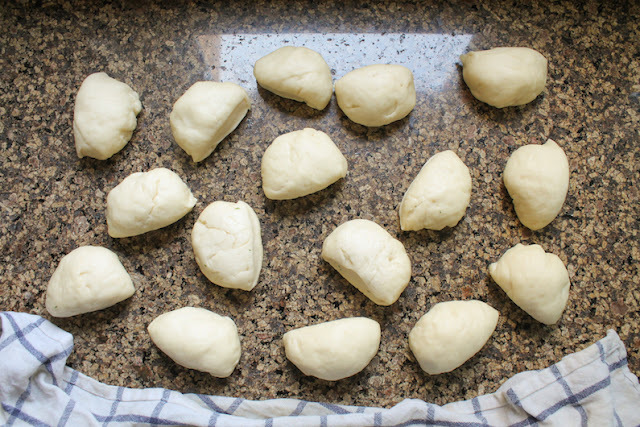 Bake for about 14-16 minutes or until the dough is golden and the cheese is melted and bubbling. Remove from the oven and allow to cool a bit before eating. Melted cheese will seriously burn your mouth if you bite in too soon! Serve warm. If not eaten right away, these can be kept in the refrigerator in an airtight container. Give them 10 seconds on high in the microwave before serving. This month my Bread Bakers group are celebrating October with Middle Eastern breads. Many thanks to our host, Karen from Karen's Kitchen Stories. Check out all the great recipes! *Amazon affiliate link - If you buy through my affiliate link, I earn a few cents at no extra cost to you. Thanks for supporting Food Lust People Love.